Peeps Diner --We used spools, beads, bottle caps, and small silk flowers for the props in the diorama. Problem: The rabbit Peeps are not flat on the bottom, making them harder to stand up in a scene. Solution: Cut off the bottom so that the rabbit stands flat. We tried snipping and cutting, and found that you could get the best cut with a good, sharp knife dipped in water. 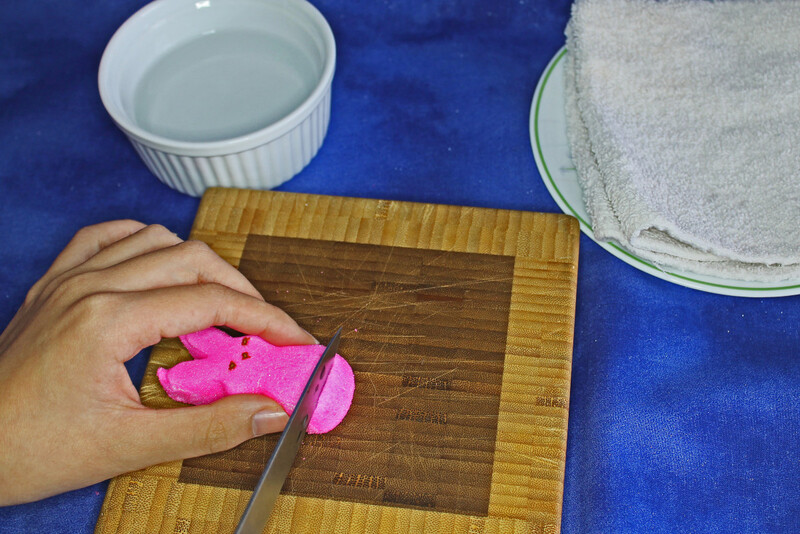 Cut the bottom of Peep with a sharp knife dipped in water. Problem: All Peeps are squishy and hard to handle without damaging. Solution: Buy your Peeps a week ahead of time, take them out of the package and lay them out to dry (after you've cut the bottoms flat.) Tip: We learned by hard experience not to stand the Peeps up to dry .They will stick amazingly well to the surface. Lay them down on their sugary backsides. Problem: Peeps have rather blank expressions. Solution: Make sure the scene and costumes convey your scene and story. It's tricky to draw facial features on Peeps, though it can be done. Most people use the rabbit Peeps because at least they stand upright and look a little more like people. 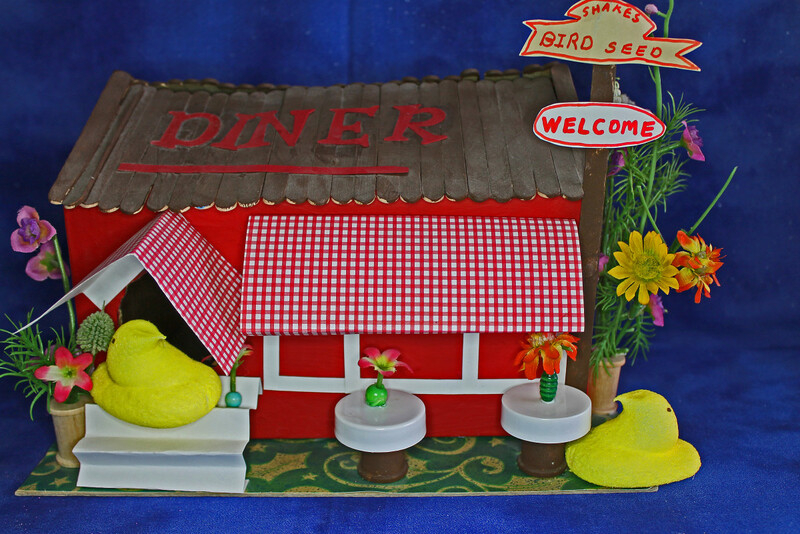 But, if you can think of a diorama in which chickens look good (like my Bird Diner), you can use them as well. Step 2: How to generate an idea for your Peeps diorama and sketch out a plan. You want the scenery to do most of the work for your diorama. Most people like to use scenes from pop culture—books, movies, or television—as their setting. 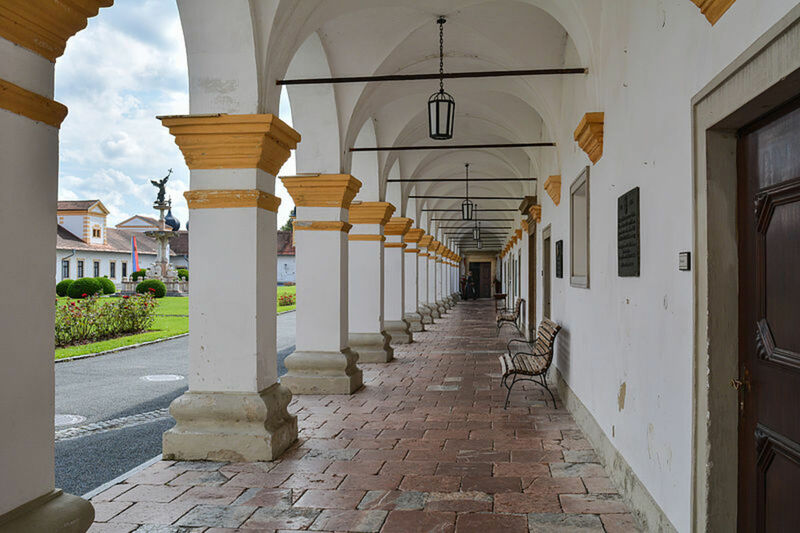 In choosing your scene, remember that you’ll need to find something instantly recognizable. For inspiration, see the links at the very end of this entry. One of my favorites is “The Trouble with Tribbles” Peeps diorama from Star Trek—genius! All they did was recreate the hold from The Enterprise, dress the Peeps in uniforms, and throw in a few brown pom-poms. Step 3: Gather materials for the setting of your Peeps diorama. This is a big process, so I’ve divided it into parts A, B, and C.
You can use foam board as a base for your diorama. Print out pictures for the backdrop. My colleagues and I made several dioramas of “Peeps in the Park” for children in the library to decorate, and I had good success using foam board. We scored the board down the middle so that it would form the base and the backdrop. Then we made cross-supports that we taped on the sides to hold them in position. These diorama supports were light but strong, and suited for display in our case. 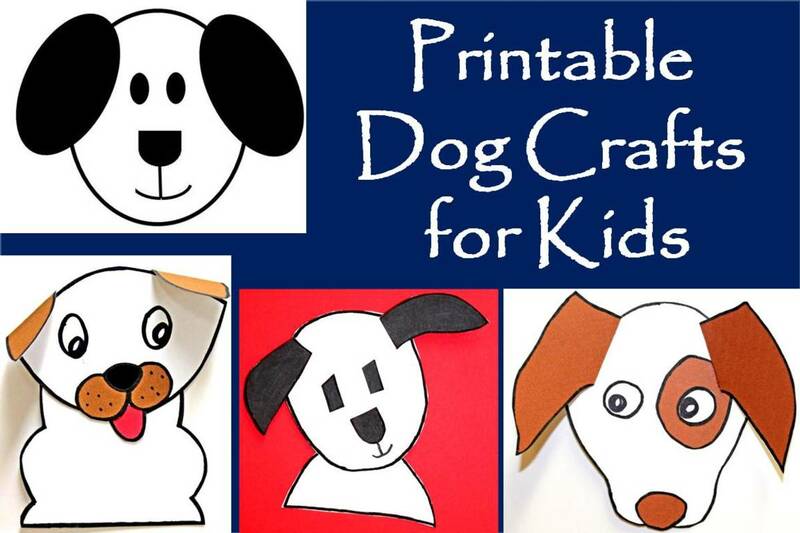 Step 3 B Print out pictures for the backdrop and the floor of your Peeps diorama. Here’s my big tip for decorating the backdrop and the floor: look around on the internet for photos that show your backdrop. 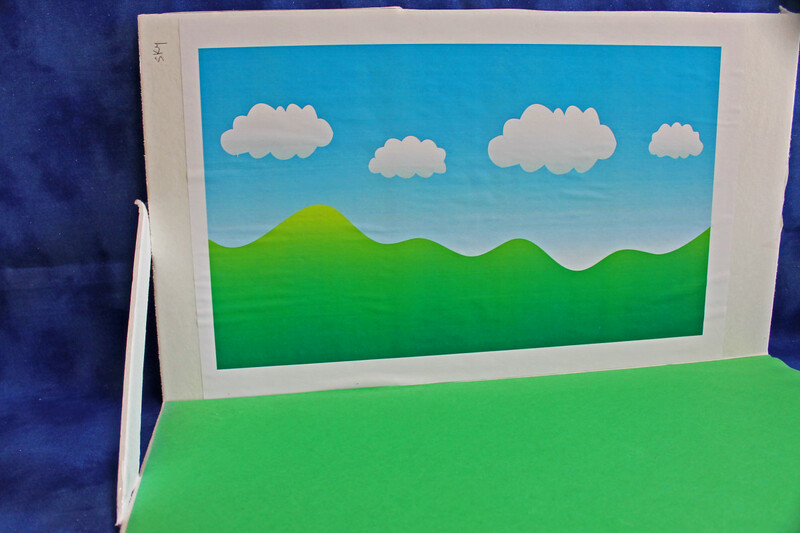 For the “Peeps in the Park” dioramas, I could have used blue construction paper for the sky and painted on the hills and clouds, but it was much easier to do a Google image search and print out the background I wanted. If you take a look at the Downton Abbey Peeps diorama in the resources list below, you’ll see that the maker printed out the iconic abbey, then lined up the residents in the foreground. Similarly, if you wanted to do the Stay Puft Marshmallow man scene from Ghostbusters, it would be easiest to print out the image of the big guy for you diorama, rather than trying to create him yourself. Step 3 C How to gather or make props for the set of your Peeps diorama. You can go the more expensive, but quicker route of buying miniatures to complete your scene. You can find miniatures for almost everything. 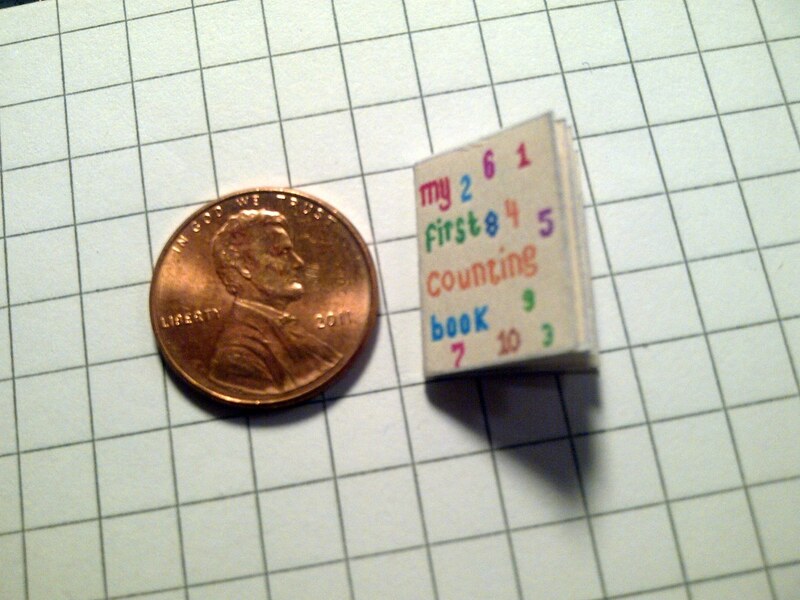 If you look around on Amazon, you can find most anything, from minuscule food cans to itty-bitty furniture to teeny tiny books. If you’d rather go low-cost but creative, you can use found objects to create little miniatures. 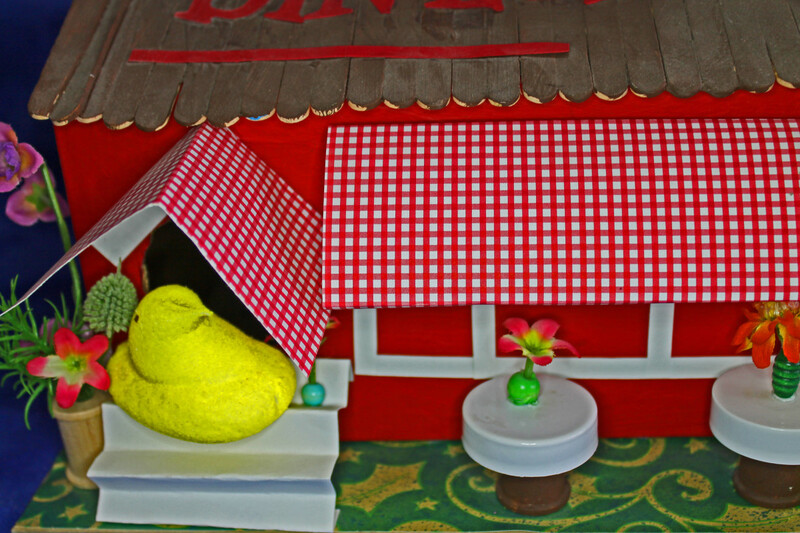 For example, in my “Peeps Diner” diorama, I used thread spools for table bases and flower pots. For the table tops, I glued on vitamin pill bottle lids. And for the tiny vases, I used wooden beads with some small silk flowers tucked inside. Use found objects--like spools, bottle caps, and beads to decorate your Peeps diorama set. Take a look around your home to find small objects that might serve as props for your Peeps diorama. 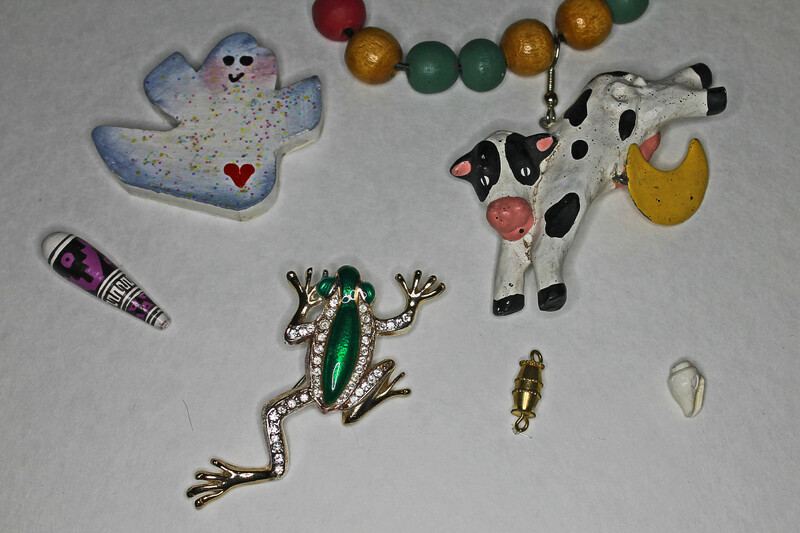 Here are some of the things I found, looking through junk drawers and old jewelry. These little things from my jewelry box could function as props in a Peeps diorama. Clay is also versatile and can be molded into anything you need. My daughter air dry modeling clay to make a sculpture for our “Peeps at the Art Museum” diorama. For more ideas, use the search terms “making miniatures” on the internet. See the resources listed at the bottom of this site for a great Pinterest board that has tutorials on making miniatures. Step 4: How to use the right materials to attach everything for your Peeps diorama. For the backdrops and the floor, I like to use a non-wrinkling glue stick to attach them to the base. For gluing props together glue guns work great. Note—only use the glue gun for the props. 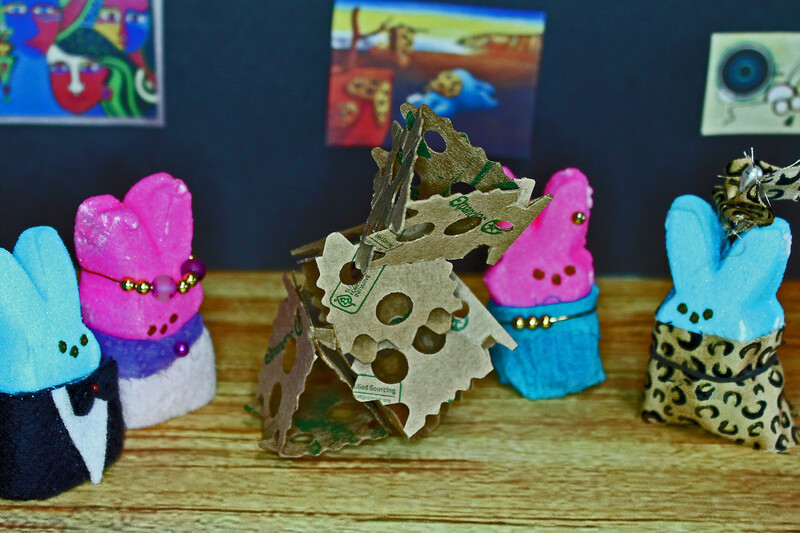 Peeps will melt with hot glue—they are marshmallow, after all. 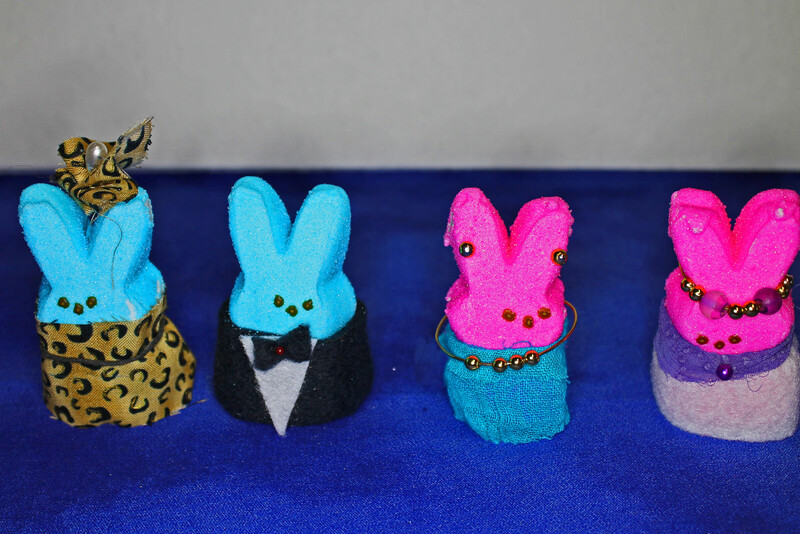 Step 5: How to dress the Peeps for your diorama. Judging from the Peeps diorama photos on the ‘net, this is the part that gives people the most problems. Peeps are sugary little fellas, so markers don’t work terribly well for coloring them, though you can use a fine-tip Sharpie to make facial features, tattoos, etc. Some people use icing, which goes on pretty well, but is kind of a hassle when you’re placing the Peeps in the diorama, since you have to be careful not to mess up your frosting job when moving them around. 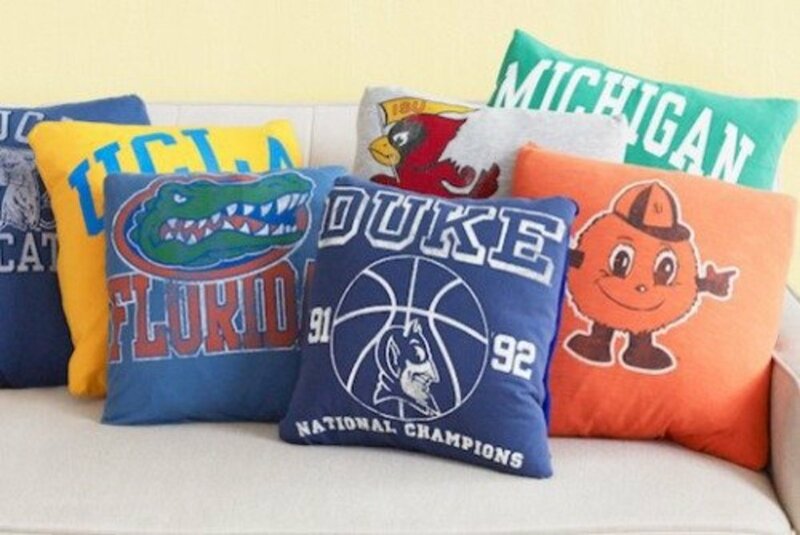 I like to use fabric, especially the kind that drapes easily. Try thin synthetic knits. Often you can find reduced-price packages of fabric at the store that are odd-sized pieces left from the ends of bolts. I used bits of cloth, pins, and jewelry to dress up these Peeps for the diorama. I try not to get too fancy with the little details of clothing for the Peeps. 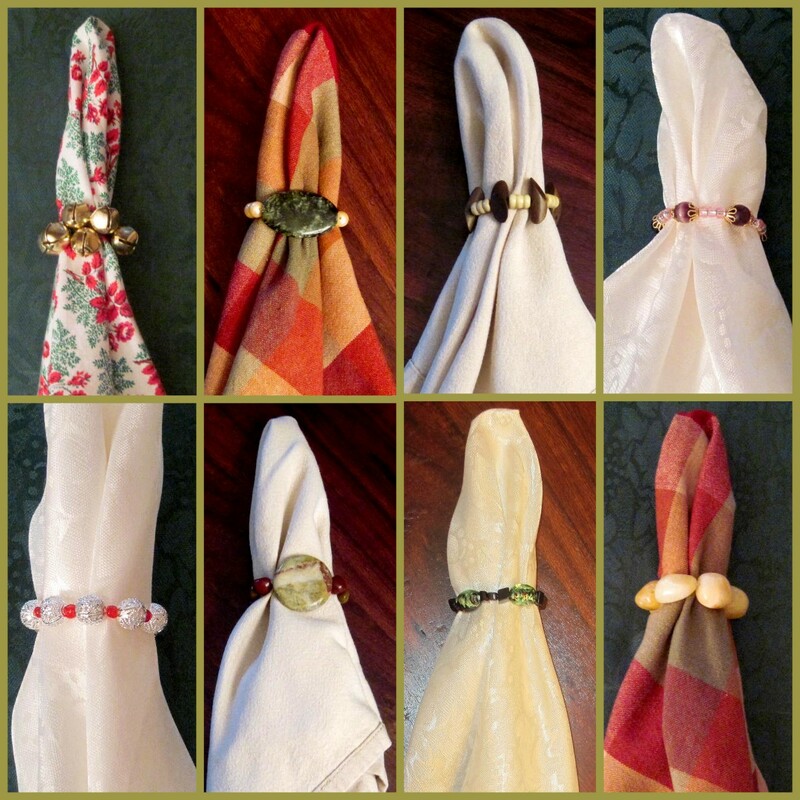 For women, I cut a small rectangle and tie it with a cord or piece of fabric around the “waist.” No need to glue it on. For the man, I cut a rectangle of black felt and a few little triangles for the shirt and tie. 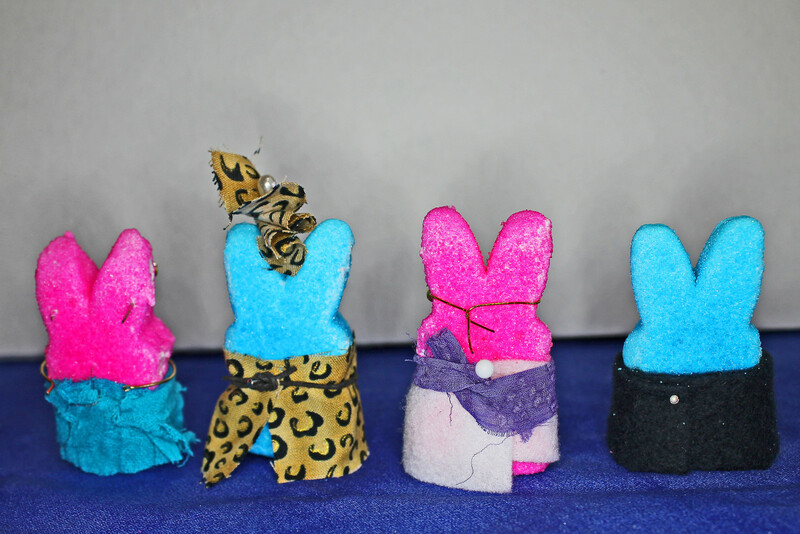 To make it super fast, I pinned the clothing into the Peeps. 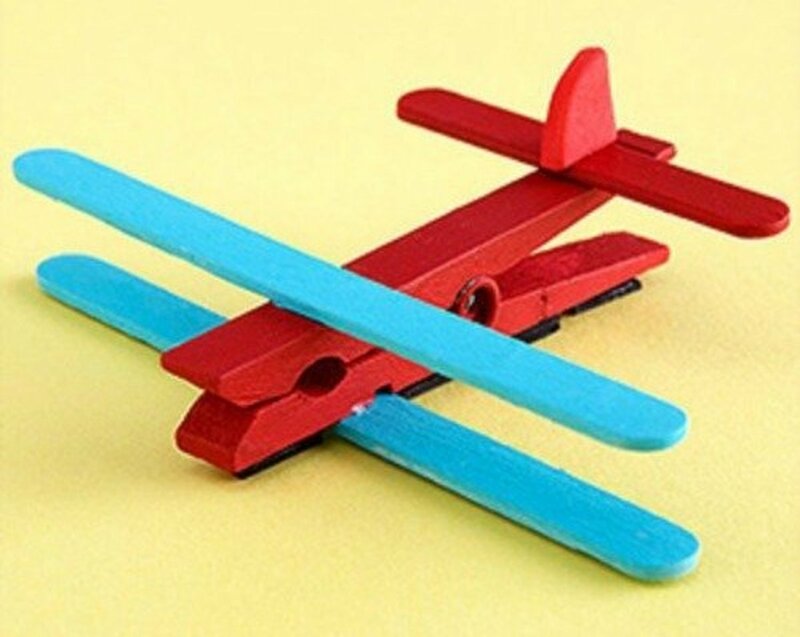 This way, I don’t have to wait for any glue to dry. And sometimes, the pins have little beaded ends that I work into the outfit. Here, you’ll see that I’ve pinned the bow tie to the guy Peep and the earrings to the gal Peeps. If you aren't going to photograph the back of the Peeps for your diorama, you can just pin and tie clothing on. On the backside, you can see all the pinning I did. I wasn’t worried about how they looked back here, since I’d be photographing my diorama from the front. Step 6: How to place the Peeps and photograph your diorama. Taking a good photograph of your Peeps diorama could be a book in itself, so I’ll just give you a few tips and send you to much more detailed resources on the web. Take lots of photos from different angles. You can decide which one is best when you are looking at them in your photos. Don’t be afraid to crop your photos to make the Peeps stand out. Use editing software to make the colors pop. Bump up the midtones and the saturation. This is a good little video that will show you the basics of setting up the camera and lights for photographing a diorama. 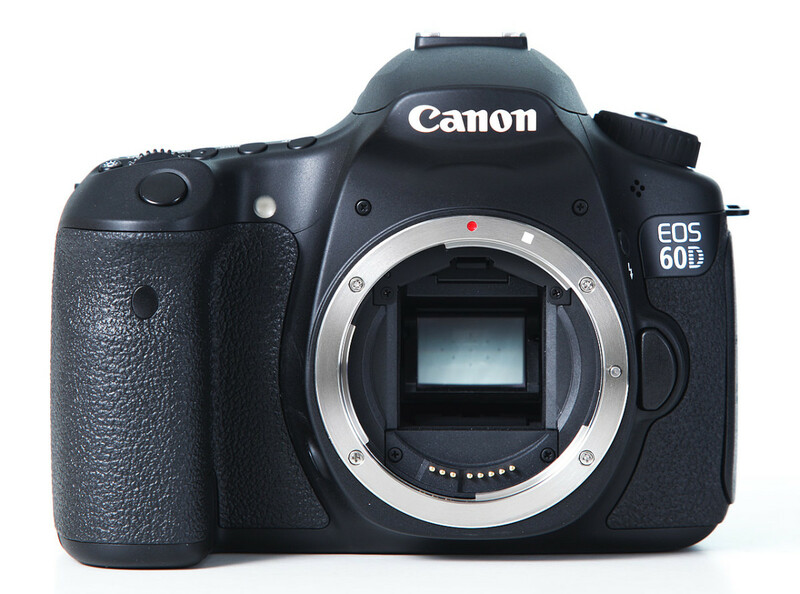 Most point-and-shoot cameras will have a manual mode, like his does. 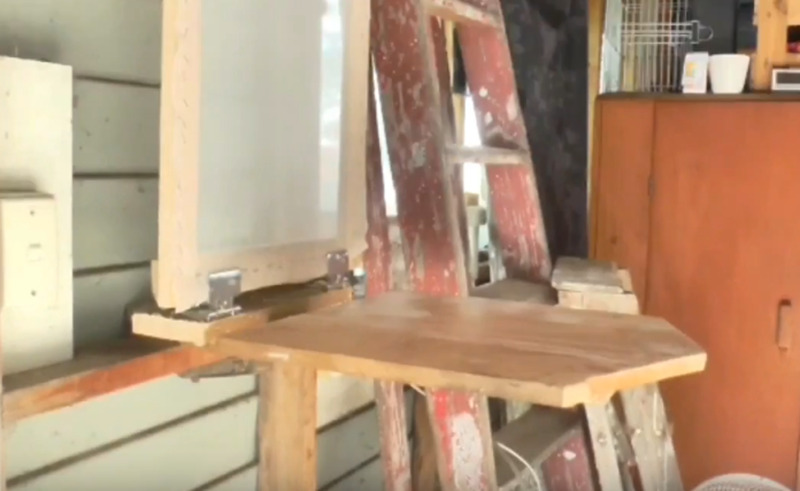 You won't necessarily need a tripod; you could set the camera on a table and use books to get it the right height. 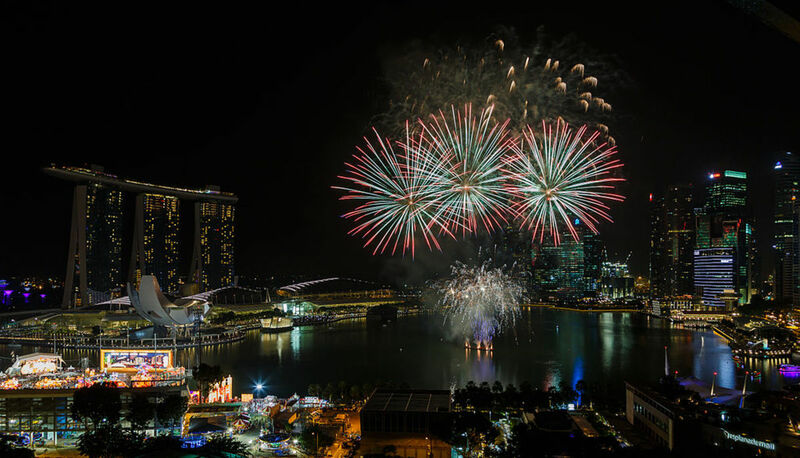 You will want to use the timer so that you avoid camera shake. Here are some dioramas from TV shows to get your ideas going. Notice the Downton Abbey diorama. The creator printed out the photos, dressed the Peeps and arranged them in their iconic triangle. This Geeky site includes the Trouble with Tribbles diorama I mentioned. It appears that this creator used frosting to give the Peeps the appropriate Star Trek uniform. Since I am a children’s librarian, I find this diorama takeoff of the classic book, Everyone Poops hilarious. But even if it’s not your type of humor, this little video points out lots of little details that made this the winning entry. I’m guessing this is a library’s contest. 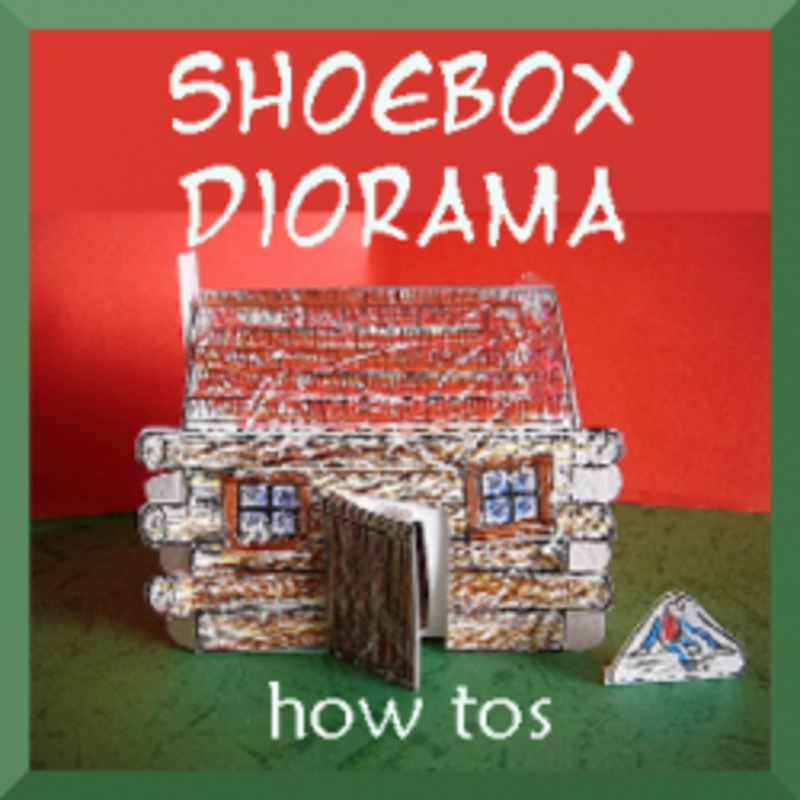 There are lots of ideas here to get you started on your own Peeps Diorama. I'd love to hear from you! 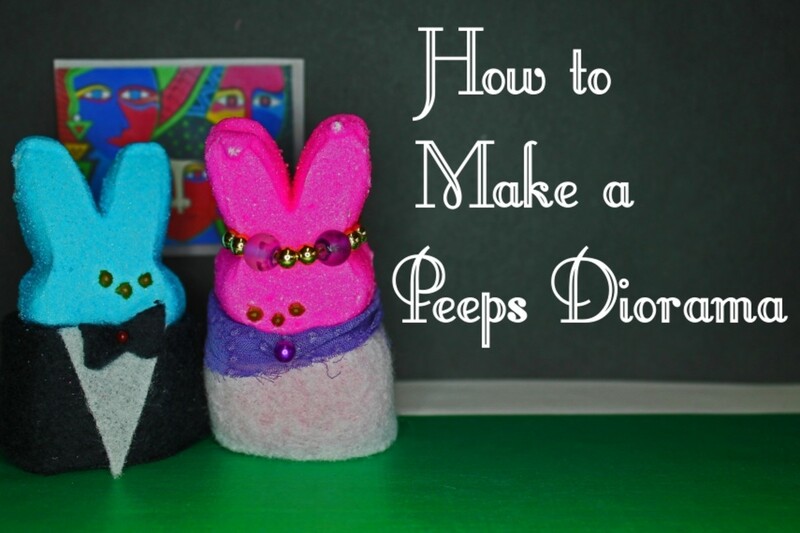 Share any tips you have for how to make a Peeps dioramas.